[pdf document, Dr. Philip Landrigan, M.D., MSC , American Journal Of Industrial Medicine, 42:530 531, 2002] Introduction by Dr. Philip Landrigan to a series of brief reports by public health workers and researchers about what they have learned so far about the strengths and weakness of the U.S. public health system from the responses to 9/11/01 at the WTC. The issue also includes a summary of recommended approaches to exposure problems. The reports are based on presentations by scientists, industrial hygienists, representatives of the Fire Department of New York, and others involved in the process of rescue and recovery. 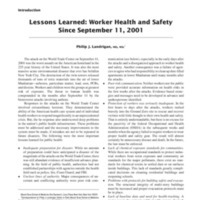 “Lessons Learned: Worker Health and Safety Since September 11, 2001,” September 11 Digital Archive, accessed April 23, 2019, http://911digitalarchive.org/items/show/2951.